Here is the list of the hotels near Eaunes. Book your hotel near Eaunes today, Thursday 09 May for the best price, reservation and cancellation free of charge thanks to our partner Booking.com, leader in on-line hotels reservation. Below here is the list the 50 closest hotels of Eaunes, sortable according your criteria. You will find the position of these accommodations on the Eaunes hotels map. Set in a mansion, Domaine de Bélair is a charming bed and breakfast located 20 km from Toulouse. It is set in the heart of the countryside and offers fitness trails, a tennis court, spa treatments including massages. The Domaine offers ensuite guestrooms and one apartment, all with free internet access. Each room has a unique themed décor and some feature Italian showers. The apartment has a fully equipped kitchen and a dining area. Guests can enjoy gourmet, seasonal cuisine on site in summer, upon reservation in the restaurant 1.5 km away. Many activities are available in the surrounding area, such as hiking, canoeing and horse-riding. Domaine de Bélair is situated in the village of Eaunes in the Midi-Pyrénées region. For those wishing to explore the area by car, free private parking is provided. Situated in the countryside, 25 km from Toulouse and 10 km from the A64 motorway, this B&B offers a 4000 m² garden with an above-ground swimming pool. Guests can borrow bicycles for free. With exposed stone walls and wooden beams, the air-conditioned guest rooms are situated in converted farm buildings. They offer a view of the garden and tea and coffee making facilities are available in each room. Homemade cakes and jams are available for breakfast each morning, which can be enjoyed on the terrace during the summer months. Additional facilities available include a children’s playground and free internet access. La Maison du Poelon is set in Labarthe-sur-Lèze. Free WiFi is available. At the guest house, each room is equipped with a patio. The rooms are equipped with a private bathroom with a shower and free toiletries. At La Maison du Poelon, every room is fitted with air conditioning and a flat-screen TV. Breakfast is available every morning, and includes continental and buffet options. Toulouse is 24 km from the accommodation, while Blagnac is 24 km away. The nearest airport is Toulouse-Blagnac Airport, 27 km from La Maison du Poelon. Located just a 10-minute drive from Toulouse, Moulin de Rudelle is set in a 16th-century building surrounded by a 5-hectare park. All accommodation features views of the garden or river, a flat-screen TV with satellite channels, a wardrobe, desk and private bathroom. The self-catering accommodation is equipped with a kitchen. A breakfast is available every morning. Toulouse Airport is ideally located a 25-minute drive away and Cugnaux is 12 km from the property. With free Wi-Fi and 24-hour reception, this Kyriad is 17 km south of the centre of Toulouse. It offers en suite rooms with satellite TV and has free parking. All guest rooms have a private bathroom with a bathtub or shower. Rooms for guests with limited mobility are also available. A buffet breakfast is available every morning in Kyriad Toulouse Sud – Roques. Reversible air conditioning is available throughout the property. Kyriad Toulouse Sud – Roques is 22 km from Blagnac-Toulouse Airport. The hotel is ideally located in a haven of greenery far from the noise and yet with a convenient access from the motorway and only 20 minutes from Toulouse. 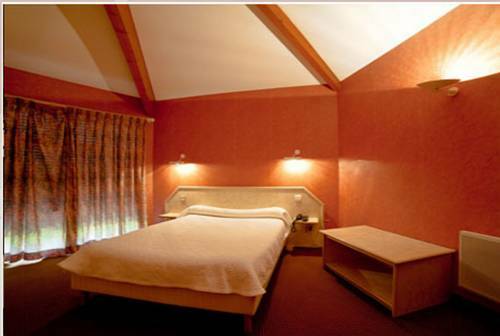 Rooms at Logis Hotel l'Arche de Noé are comfortable and each has its own individual style. Savour regional specialities in the relaxed atmosphere of the hotels restaurant. The hotel is an ideal starting point for splendid walks through beautiful countryside, and visit of delightful villages. Boasting a seasonal outdoor swimming pool, En Marge is set in Aureville. Featuring a garden, the 4-star hotel has air-conditioned rooms with free WiFi. The in-house restaurant serves French cuisine. All units at the hotel come with a seating area and a flat-screen TV. En Marge offers certain rooms that have lake views, and the rooms are fitted with a private bathroom with a shower. Guest rooms feature a desk. A continental breakfast can be enjoyed at the property. The accommodation offers a terrace. The area is popular for cycling and hiking. Toulouse is 16 km from En Marge. The nearest airport is Toulouse-Blagnac Airport, 28 km from the hotel. Set in Lherm, Chambres d'hotes ASAM features a garden and a terrace. Guests can enjoy garden views. All guest rooms in the guest house are fitted with a flat-screen TV. Each room includes a private bathroom with a shower and free toiletries. The units will provide guests with a fridge. A continental breakfast is served daily at the property. Toulouse is 33 km from Chambres d'hotes ASAM. Toulouse-Blagnac Airport is 36 km from the property. Featuring free WiFi throughout the property, Le Rouge-gorge du Pescofi is set in Portet-sur-Garonne, 11 km from Toulouse. Blagnac is 13 km from the property. Free private parking is available on site. Some units are air conditioned and include a seating and/or dining area. There is also a kitchenette, fitted with a dishwasher. Le Rouge-gorge du Pescofi also includes a fitness centre. The property also offers packed lunches. There is a bus stop in front of the property servicing the hospital and the city centre. The area is popular for cycling and hiking. Saint Jean is 19 km from Le Rouge-gorge du Pescofi, while Revel is 50 km away. The nearest airport is Blagnac Airport, 13 km from Le Rouge-gorge du Pescofi. Set in Villeneuve-Tolosane, Au Jardin de la Saudrune is a family run accommodation which offers a seasonal outdoor swimming pool. Free WiFi is available throughout the property and on-site parking is provided. All guest rooms in the guest house are equipped with a flat-screen TV. Rooms include a shared bathroom and a shower, while certain rooms come with a balcony. Toulouse is 11 km from Au Jardin de la Saudrune, while Blagnac is 13 km from the property. The nearest airport is Toulouse-Blagnac Airport, 12 km from the property. Set on a spacious garden, Le Clos de Mara B&B is located in Issus just 30 km away from the centre of Toulouse and offers bed and breakfast accommodations. Guests can enjoy the outdoor swimming pool in the warmer months. The rooms at Le Clos de Mara B&B are individually decorated and offer free Wi-Fi. Each room features a seating area, a microwave and a fridge, and each has a private bathroom with a shower. Every morning a continental breakfast with homemade products is served. Upon request, the hosts can prepare evening meals for guests featuring regional specialities. The Vernet Train Station is 12 minutes away and the Toulouse-Blagnac Airport is 35 minutes away. Guests can visit the Canal du Midi and play golf at the Toulouse La-Ramée Golf Course just 15 km away. Situated in Vigoulet-Auzil, Chambres d’Hôtes d’Arquier is set in a manor from the 19th century designed by artist Marc Saint-Saëns. It offers a large park with 100-year old cedars tree and an outdoor swimming pool. All of the large rooms have a view of the park. They are uniquely decorated and the private bathroom includes free toiletries. A homemade breakfast is available every morning. After breakfast, you can use free Wi-Fi access, available in every room. It is 15 km from the historic centre of Toulouse and 25 km from its airport. Vieille-Toulouse Golf Club is 6 km away. Chambre d'hotes Aux deux Figuiers in Auterive features a garden and a terrace. Both free WiFi and private parking are available on site. At the guest house, all rooms come with a wardrobe. When guests need guidance on where to visit, the reception will be happy to provide advice. Toulouse is 41 km from Chambre d'hotes Aux deux Figuiers, while Blagnac is 42 km away. The nearest airport is Toulouse-Blagnac Airport, 45 km from the accommodation. This Premiere Classe Hotel is situated next to the A64 motorway, just 10 km south of Toulouse city centre. It offers en-suite rooms with free Wi-Fi internet access and a TV. Breakfast is served daily at the Premiere Classe Toulouse Sud – Portet. Guests are invited to relax in the garden terrace and the hotel provides a 24-hour reception and free newspapers. Free private parking is available on site and the Toulouse-Blagnac Airport is a 20-minute drive away. Located a 20-minute drive from Toulouse centre and near Toulouse South and West industrial areas, this guest house offers a shaded terrace and a quiet garden. A flat-screen TV is provided in the guest rooms, as well as free WiFi throughout the property. Each guest room is individually decorated and features a desk. The bathrooms are private and all of them have a hairdryer and free organic toiletries. A continental breakfast is served every morning at La Cognée. Guests can enjoy a drink at the bar. Evening meals prepared with local produce can be shared at the owner's table and enjoyed on the terrace, weather permitting. Public parking is free on site. Toulouse-Blagnac Airport is 15 km away. La Victorine is a guest house located in Vieille-Toulouse, a 15-minute drive from Toulouse. It is set in a garden with an outdoor swimming pool and views over the Ariège River. With a private entrance and a terrace, the room at La Victorine includes a seating area, a desk, a TV and free WiFi access. The private external bathroom is fitted with a shower and comes with a hairdryer and bathrobes. There is a gastronomic restaurant 3 km from the property and packed lunches can be prepared upon prior request. La Victorine is 4 km from Toulouse Golf Club and 18 km from Toulouse-Blagnac Airport. Cycling and hiking can be enjoyed in the surroundings. The hotel is surrounded by 7 hectares of gardens and woodland located in Old Toulouse, overlooking the River Garonne. You can admire river views from the outdoor terrace and relax by the outdoor swimming pool. The air-conditioned guest rooms have a flat-screen TV with satellite channels. Each room includes a minibar and tea and coffee making facilities. Some rooms offer river views. A buffet breakfast is prepared every morning in the dining room, which features a fireplace. A 5-minute drive from the hotel, guests can find 2 restaurants. There is a nature reserve within 500 metres of the Hotel la Flanerie and an 18-hole golf course within 2 km. Toulouse Airport is 20 minutes away and the centre of Toulouse is a 10-minute drive away. Holiday home Avenue Vincent Auriol is located in Auterive and offers barbecue facilities. The accommodation has free WiFi. The villa is fitted with a satellite TV. A dishwasher and an oven can be found in the kitchen. The villa offers an outdoor pool. Toulouse is 43 km from Holiday home Avenue Vincent Auriol, while Blagnac is 43 km away. Toulouse-Blagnac Airport is 46 km from the property. Hotel Restaurant L'Hotan is located 7 km from Toulouse. It is a 10 minute drive from Casino Barrière and 3 minutes from the Cancéropôle. Free parking is available. Each air conditioned L’Hotan room has a mini bar and satellite TV. Guests are invited to relax in the hotel’s relaxation space, which includes a sauna, hot tub and fitness centre. Wi-Fi is available in public areas. L’Hotan’s restaurant has a private lounge, bar and terrace. Located 15 km from Meuret Train Station and 35 km from Toulouse, and set in an 18th-century house Haute-Garonne Guest House offers a garden with a furnished terrace. At Haute-Garonne Guest House, guests can find a room with a seating area and free WiFi access as well as a private bathroom with a bathtub, a shower and a hairdryer. A continental breakfast is served daily at an extra cost. Stores and a traditional restaurant can be found within 3 km. Guests can also enjoy a shared lounge and a billiard table. Hiking and bicycling can be enjoyed in the surroundings. A64 Motorway is located 15 km from the property where free parking is available. L'Initial is located in the Midi-Pyrénées region, a 20-minute drive from Toulouse city centre. It offers a seasonal outdoor swimming pool in the garden with a tree-lined terrace. Guest rooms at this hotel are individually decorated and are equipped with satellite television and free wi-fi access. Each room features a tiled private bathroom. L'Initial features a bar and restaurant serving lunch and dinner during the week and at the weekend upon request. Guests can choose between a buffet breakfast and a continental breakfast in the morning. L'Initial inlcudes a 24-hour front desk and room service is available. With free private parking on site, Toulouse-Blagnac Airport is 13 km from the hotel. Located just outside Toulouse, on the road heading towards the Pyrénées Mountains, this charming hotel with a restaurant offers modern, well-equipped rooms with free Wi-Fi internet access and satellite TV. Guests at Le Trèfle can enjoy inventive cuisine in the friendly atmosphere of the hotel restaurant. Free private parking is provided at Le Trèfle, making it easy to get around Toulouse and the Midi-Pyrénées region by car. You are only a 10-minute drive from the Capitole de Toulouse and a 20-minute drive from Toulouse Blagnac Airport. The friendly and attentive staff at Le Trèfle will be happy to help you organise your stay in Toulouse 24 hours a day. This red-brick residence is just a 2-minute drive from Cugnaux, in Haute-Garonne. It offers single-storey studios surrounded by a garden. The accommodations at Le Patio Occitan have a flat-screen TV. They all feature a bathroom with shower and offer a terrace with direct access to the garden. A continental breakfast is served every morning in the communal lounge or directly in your room if you reserve 24 hours before arrival. You can also decide to cook in the equipped kitchenette or to organise a BBQ in the garden. Free Wi-Fi is available in the hall and free, secured parking is also possible on site. Nearby shops and restaurants are within 1 km and Toulouse is just a 20-minute drive from the residence. A 40 minutes’ drive from Toulouse, Le Soubiran offers bed and breakfast accommodation with a seasonal outdoor swimming pool, a 3000 m² garden with outdoor furniture and free Wi-Fi in the public areas and in some rooms. In the morning, a French breakfast is served, including pastries and homemade jam. Evening meals are also available on request and include organic produce from the vegetable garden. The bedrooms have a private bathroom with walk-in shower and bathroom amenities. There is also a TV and a complimentary water bottle in each room. A 20-minute drive from Muret Train Station and a 30-minute drive from Teoula Golf Course, Le Soubiran has free on-site parking. Just a 20-minute drive from the centre of Toulouse, this guest house offers an outdoor swimming pool. Its guest rooms are all located on the ground floor and have a private terrace. An LCD TV with a DVD player is also featured in the rooms at Le Domaine de Dubac. They are all decorated in a different style and include an en suite bathroom, which is complete with a hairdryer. A continental breakfast is provided every morning on the terrace or in the conservatory. After breakfast, you may choose to explore to relax in the garden and read a newspaper from reception. Free Wi-Fi is available and free, secure private parking is possible on site. The guest house is located just a 10-minute drive from the A64 motorway and Ramée Golf Club is a 2-minute drive away. Located in Toulouse south west activities zone, Residence Thibaud is set in a 2-acre park with a seasonal outdoor swimming pool. A table tennis is also available. Free WiFi access is provided in each Résidence Thibaud air-conditioned accommodation, where guests will enjoy a garden view, a flat-screen TV and a private bathroom. A 14-minute drive away, they will find bars and restaurants in the centre of Toulouse. They can also use the on-site barbecue facilities or the equipped kitchens of the property’s studios. Private parking is possible on site. Toulouse Blagnac Airport is just 13 km away, while Matabiau Train Station is a 15-minute drive from this hotel. Guest accommodation Toulouse Preferred hotel ! This residence is located 15 minutes from Toulouse and 10 minutes from Toulouse-Blagnac Airport. It has an outdoor swimming pool and tennis court. Residence De Diane offers air-conditioned studios and apartments with free WiFi. Each unit has flat-screen satellite TV, a welcome tray and a private bathroom with a bath. The kitchenette is fully equipped with a dishwasher and microwave. A breakfast buffet is served daily at the Residence de Diane, and guests can enjoy an evening drink in the bar. Guests can dine at one of the property's partner restaurants, or reserve a meal basket with a supplement to be enjoyed in the comfort of their room. The Residence de Diane is just 2 kilometres from the Ramee golf course. Water sports facilities are also available at the nearby lake. Bed and Breakfast Deyme Preferred hotel ! Boasting a garden and a terrace, Les Hauts de Sames offers accommodation in Deyme with free WiFi and garden views. The property has city views and is 17 km from Toulouse. This bed and breakfast comes with a seating area, a kitchen with an oven, and a flat-screen TV. Blagnac is 23 km from the bed and breakfast. Toulouse-Blagnac Airport is 26 km away. Chez Isabelle is situated in Auterive and offers barbecue facilities. The homestay has mountain views and is 45 km from Toulouse. The homestay is fitted with a flat-screen TV. The homestay offers a children's playground. Guests can go fishing or hiking or relax in the garden. Blagnac is 45 km from chez Isabelle. The nearest airport is Toulouse-Blagnac Airport, 48 km from the property. Located in Toulouse, Villa Occitania is 5 km from Toulouse Stadium. The property is around 5 km from Toulouse Expo, 11 km from Zénith de Toulouse and 12 km from Amphitheatre Purpan-Ancely. Facilities include an outdoor swimming pool and free WiFi is accessible. All units in the guest house are fitted with a kettle. With a private bathroom equipped with a bath and free toiletries, some units at Villa Occitania also boast a mountain view. All rooms are equipped with a TV with satellite channels. A continental breakfast can be enjoyed at the property. The accommodation offers a terrace. A variety of popular activities are available in the area around the property, including skiing and cycling. Jardin Royal is 6 km from Villa Occitania, while Le Pont Neuf is 6 km from the property. Toulouse-Blagnac Airport is 17 km away. Situated in Ramonville-Saint-Agne in the Midi-Pyrénées Region, Domaine De Montjoie boasts a sun terrace and views of the garden. Free private parking is available on site. The rooms are fitted with a flat-screen TV. The rooms come with a private bathroom. Domaine De Montjoie features free WiFi throughout the property. There is a shared lounge at the property. Guests can dine at the hotel's restaurant, Le M de Montjoie, which is open for lunch and dinner from Monday to Friday. Toulouse-Blagnac Airport is 12 km away. Located in Toulouse, next to IUCT, Pierre Fabre and Sanofi buildings, Mercure Toulouse Sud is located in Toulouse and is also 3.7 km from Toulouse Expo and 5 km from Zénith de Toulouse. It offers air-conditioned rooms with free WiFi access, a 24-hour front desk and a business corner. Guests at Mercure Toulouse Sud can find 2 panoramic elevators as well as rooms with a private bathroom. There is also a lounge-bar set in the hotel's atrium where guests can relax with a drink, or a book. A buffet breakfast is served in the morning in the dining room or on the terrace. Amphitheatre Purpan-Ancely is 7 km from Mercure Toulouse Sud, while Toulouse Stadium is 3.3 km from the property. Blagnac Airport is 9 km away. Featuring a garden, Maison des Merles provides accommodation in Plaisance-du-Touch with free WiFi and garden views. This holiday home features a terrace. The holiday home has 1 bedroom, a living room, and a kitchenette with a dining area and a microwave. The holiday home also offers a flat-screen TV and 1 bathroom with a shower. Zoo African Safari is 3.6 km from the holiday home. Toulouse-Blagnac Airport is 16 km from the property. Gite pompertuzat is set in Pompertuzat. This holiday home features barbecue facilities as well as a garden. Opening onto a terrace with garden views, the holiday home consists of 2 bedrooms. The kitchen is fitted with a dishwasher. Toulouse is 16 km from the holiday home, while Blagnac is 23 km from the property. The nearest airport is Toulouse-Blagnac Airport, 26 km from gite pompertuzat. Located in Toulouse, a 2-minute walk from The Garonne River and 4.5 km from Toulouse Stadium, Zenitude Hôtel-Résidences Toulouse Fluvia has spacious and soundproofed apartments and studios with fully equipped kitchenettes. Each modern apartment and studio at the Zenitude Hôtel-Résidences Toulouse Fluvia has wired internet, a dining area with a flat-screen TV with cable channels and a private bathroom. All rooms are accessible by a lift and kitchenware kits are available upon reservation. A continental breakfast is served daily in the breakfast room or on the terrace at an extra cost. Free private parking is provided. Gare de Toulouse-Matabiau Train station is a 9-minute drive away. Toulouse Blagnac Airport is 14 minutes from the hotel. Located in Toulouse, B&B Garonella sits in a garden just by the Garonne River and offers an outdoor swimming pool with terrace furnished with sun loungers and a fitness room. Free Wi-Fi is provided. The bungalow features wooden-walls and a large bedroom window overlooking the garden and the river. There is a private bathroom is fitted with a shower, free toiletries and hairdryer. To prepare home-cooked meals, guests have access to a kitchen equipped with microwave and refrigerator. Restaurants are a 5-minute drive away. Metro Station Université Paul-Sabatier is located 4.6 km away and Toulouse Zénith is 7.5 km away. Cité de L’Espace Theme Park is located 12.7 km away and Golf Club de Toulouse is just 2.8 km away. Situated 500 metres from the Canal du Midi, this hotel is a 15-minute drive from Toulouse City Centre and a 45-minute drive from Carcassonne. It offers free private parking and free Wi-Fi access. The guest rooms at the Aer are equipped with a flat-screen TV with satellite channels. Each has a private bathroom with shower or bath, and some are air-conditioned. A full buffet breakfast is served every morning and meals are available and can be served in the guest rooms. Tray meals can be ordered to the room and there are also several restaurants nearby. Additional features include a vending machine, coffee machine and bike storage. This hotel is a 15-minute drive from Place du Capitole. Canal Ramonville Saint Agne Technological Centre is also nearby. Featuring garden views, Plaisance du Touch is set in Plaisance-du-Touch, around 4.3 km from Zoo African Safari. Guests are welcome to enjoy the free WiFi. The apartment is located on the ground floor and has 1 bedroom, a flat-screen TV and a fully equipped kitchen that provides guests with an oven and a microwave. The apartment offers a terrace. The nearest airport is Toulouse-Blagnac Airport, 17 km from the property. Comfort Hotel Toulouse Sud is located in the southern most part of Toulouse at the crossroads of the Autoroute des 2 Mers near the Technological Parc Canal and Labège Innopole. Toulouse Stadium is less than 4 km away. Free parking is available on site. This Comfort Hotel is composed of 2 buildings and offers air-conditioned guestrooms that are spacious, clean and comfortable. All rooms are equipped with bath, TV and telephone. The surrounding area offers a variety of restaurants and bars. There are 5 seminar rooms available. The Comfort Hotel Toulouse Sud is an ideal location for guests visiting Toulouse, or wishing to travel to Carcassonne or Albi. In this area of Toulouse guests are close to Toulouse-Blagnac International Airport, Paul Sabatier Univerity, and the Toulouse Golf Club. 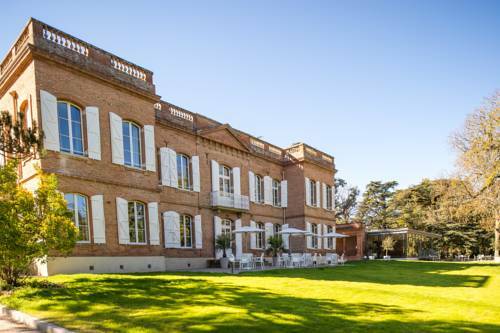 Offering a tennis court and garden view, Le Domaine des Capitouls is set in Toulouse, 3.6 km from Toulouse Stadium and 5 km from Toulouse Expo. The apartment, set in a building dating from 1996, is 7 km from the Zénith de Toulouse and offers free WiFi. The apartment features 1 bedroom, a flat-screen TV, an equipped kitchen with a microwave and a fridge, and 1 bathroom with a bath. The apartment offers an outdoor pool. A terrace can be found at Le Domaine des Capitouls, along with a garden. Amphitheatre Purpan-Ancely is 9 km from the accommodation, while Jardin Royal is 6 km from the property. The nearest airport is Toulouse-Blagnac Airport, 13 km from Le Domaine des Capitouls. Located 1 km from the A61 motorway and 24 km from Toulouse, Motel Restaurant l’Enclos offers a French restaurant and a bar. The rooms have a LCD, satellite TV and a hairdryer. The private bathroom is fitted with a bathtub. Free Wi-Fi access is provided throughout the property. A continental breakfast is available every morning and can be brought to your room. Dishes such as Confit de Canard and Noix de Saint-Jacques can be sample on site. It is 17 km from Toulouse Train Station and 14 km from Toulouse Golf Club. There is a free, private car park on site which doesn’t require reservation. A B&B located a 20-minute metro ride from the centre of Toulouse, Le Clos Tolosan is set in a 19th-century house with a garden and a furnished terrace. Viewing the garden, each room at Le Clos Tolosan includes a flat-screen TV and a private bathroom with a bathtub or a shower and a hairdryer. Breakfast is served daily and consists of French pastries, bread, homemade jams, fresh juice and hot drinks. Upon prior request and reservation, guests can share evening meals at the owner’s table. At Le Clos Tolosan, a shared kitchen is at guests’ disposal as well as a shared lounge. Ramonville metro station is just 800 metres from the property and Toulouse Matabiau Train Station a 20-minute drive away. Les Oliviers is located in Saint-Léon and offers a seasonal outdoor swimming pool and barbecue facilities. Guests staying at this holiday home have access to a fully equipped kitchen and a terrace. This holiday home features 1 bathroom with a shower and free toiletries. A flat-screen TV and DVD player are provided. A continental breakfast is served daily at the property. Guests can relax in the garden at the property. Toulouse is 41 km from the holiday home. The nearest airport is Toulouse-Blagnac Airport, 41 km from Les Oliviers. 4 km from Zénith de Toulouse, Le jardin bleu Basso Cambo Université Météo France is located in the Toulouse West district of Toulouse. Guests staying at this apartment have access to free WiFi and a fully equipped kitchen. The apartment has 1 bedroom and 1 bathroom with a shower and free toiletries. A flat-screen TV is provided. The apartment offers a terrace. Guests can also relax in the shared lounge area. Toulouse Stadium is 5 km from Le jardin bleu Basso Cambo, while Amphitheatre Purpan-Ancely is 7 km from the property. Toulouse-Blagnac Airport is 11 km away. Hotel Saint-Lys Preferred hotel ! The Residence Des Ondes is located 800 metres from Saint-Lys, in the Midi-Pyrénées. It offers en-suite guestrooms with air-conditioning, satellite TV and free Wi-Fi. Guests of the Residence Des Ondes can enjoy a buffet breakfast in the hotel’s dining room. The Residence Des Ondes is situated 15 minutes from the Blagnac Airport. Free private parking is provided. Set in Toulouse, Studio Premium Toulouse Basso Cambo Météo France provides accommodation with a seating area, a flat-screen TV and a kitchen. Free WiFi is provided. Each unit comes with an oven, microwave, a coffee machine, as well as a toaster and kettle. There is a fully equipped private bathroom with bath and free toiletries. The apartment offers an outdoor pool. Guests at the property can enjoy tennis on site, or cycling in the surroundings. Zénith de Toulouse is 4.1 km from Studio Premium Toulouse Basso Cambo Météo France, while Toulouse Stadium is 5 km from the property. The nearest airport is Toulouse-Blagnac Airport, 13 km from the property. Below here is the hotels map of Eaunes. Names and details of Eaunes hotels can be shown on the map clicking on the prices icons.